James Ruckley takes on the 'Monster'. Unprepared. With rather unconventional pre-race preparation (actually, none...), James Ruckley found himself at the start line of the Monster Middle Triathlon recently in Ely, Cambridgeshire. After an hour's sleep in the car and a Battenburg for breakfast, how did it go? While no records were broken in the content of this feature, it does sound like a race well worth considering next year, with James commenting, "Throughout the race I cannot place one fault on organisation, logistics or marshaling..."
It was late Thursday night that AlphaWolf’s Bethany made me aware of her weekend plans to be at a Middle Distance Triathlon, The Monster. She set about trying to persuade me into attending - not something that takes much, granted - but I had my reservations. I hadn’t swam in 11 weeks since my iron-distance, hadn’t cycled over 20 miles since my iron, and I haven’t run a half marathon since, well, you guessed it. Still, never one to back down from a challenge and with a new bike ready, this was the perfect opportunity! A swift message fired off to Monster on Friday morning with replies coming thick and fast; by Saturday morning it was confirmed, I’d be attending! 19 hours after it was confirmed I would be stood on a start line, I best start packing! Now if the late registration sounds unorganised, try leaving work, in Poole at 11pm on Saturday, going home via boat and car, packing your entire kit in 40 minutes, driving for 3.5 hours and sleeping in the car for one hour, then getting ready to race. My pre-race breakfast of a large Starbucks and a Battenburg stood me in good stead, but needless to say, I wasn’t feeling fresh standing on the start line. But, I relish that fear! Racking up a few moments before was a rush, I was running so late I’d decided not to worry about organising my kit in T1. I threw on my customary £30 Gul wake boarding wetsuit and mingled with the likes of Huub, TYR and Zone3 owners. Unlike my iron, this swim was against the wind and I wasn’t expecting a great time at all. Some of the others were suggesting times of 50+ minutes, a time I came to terms with. I’d been put in to the slower wave starting 10 minutes after the first at 7:10. With no chance of me hanging on to the others I was happy to be starting after and not getting in the way. This was a personal slog and slowly I was getting into the zone. Heading into the water last in our wave, I immediately shot to the back. The sound of a horn started the charge lead by the local Mayor and Beth from Alphawolf on a canal boat. My routine began as I continuously put one arm over the other swimming into others and being kicked. Triathlon is a contact sport, don’t believe anyone who says it isn’t. Set on the beautiful River Great Ouse the first half of the swim headed up the river with no real navigation needed. The straight line swim made for a nice change and what you’d think would be an easy day but with my lack of swimming practice I seemed to veer all over the place. The scenery for this section was stunning with every breath bringing a new section of reeds and a different angle of the cathedral in the distance. The second section started beyond the bridge and was much more spectator friendly. A narrowing of the swim area was brought about by surrounding house boats while the quay was littered with great numbers watching on. My poor navigation hit hard here as I drifted across the swim lane into stationary boats and other racers. While the scenic views changed the swimming remained the same; left arm, right arm, repeat slowly. Exiting the swim I was struck with a familiar dizziness. Forgetting to put in my ear plugs that morning had hit me hard and I took a moment to myself to walk back to transition, steadying myself before unpacking the kit I’d need. First I placed on my helmet before locating my shoes. Putting on my cycling shorts and tri top came next while I jogged to the registration tent in search of safety pins having forgotten my tri belt. From here a very kind BTF marshal pinned my number on as I stuffed my pockets full of Haribo and fitted my saddle bag and top tube nutrition pouch. Unracking my bike I shot out. T1 had taken me 13 minutes which is fairly awful... but I knew I’d soon make up time on those I exited the water with and off I went. Exiting the local town on beautiful smooth roads was a joy in itself. The event made brilliant use of local A-roads ensuring a fast start. Sheltered originally it was nice to get the legs warm before we headed out into the countryside attacking the B-roads. One of the toughest challenges of the day was the weather the Monster team summoned. Howling winds coupled with blistering sun slowing even the fastest of bike splits on the day. Heading into the wind with an output of 240w I was struggling to maintain 17mph on the flats while the addition of hills reduced me to 13mph. The course was created from two laps of an extended loop. Confusingly the wind managed to remain as a head wind for at least 75% of the cycle with its swirling nature allowing only brief moments of relief. One of the more relaxing sections was an extended ride along the A10 which, while littered with traffic, had nearly no wind effect allowing a rare opportunity to hit a high gear and power through. Throughout my iron race a few months back I forgot to eat and drink and so that was a keen focus in my ‘extended’ preparation. Thankfully I still had a selection of my No.1 fuel source available, Guava Cubes from Endurance Conspiracy. Mashed Guava fruit coated in sugar and pressed into a cube they contain a vital supply of vitamins and minerals while being wrapped in an eco friendly banana leaf. In Columbia these small cubes are known as rocket fuel and once you’ve tried one, you’ll understand. Maintaining fluids on the bike was a little difficult this time round. My lack of preparation meant I had no bottle cage on my bike and as such I made extended stops at the water station to stave off heat stroke. Having completed lap one the approach to lap two was filled with an anxious dread as I prepared to head into wind for a second time. With beautiful scenery and challenging twists the route made for a brilliant few hours. The marshals on route were exceptional pointing out hazardous corners, sharing a joke and providing water as you’d expect. The BTF motorcycle marshals were also both out in force and encouraging. Sharing a joke they must have passed five times checking I was okay, while ensuring every competitor obeyed the non-drafting rules. Heading into T2 having enjoyed cruising back around the town I was keen for a dramatically faster transition than the previous one. I racked up my bike, switched my bib number from back to front, took off my helmet and changed shoes, flying out. A few slow km's into the run, my legs hadn’t yet found their stride and I was already struggling under small amounts of Vastus Medials cramp (Medial Quad Muscle). Proprioceptive feedback told me I was running abnormally but couldn’t put my finger on it, my gait had changed, my hips were running wider but in my dehydrated state I couldn’t make sense of it. Passing a series of shop windows I took 30 meters to analyse my stride side on, my forefoot running stride was fine, knees were landing in the central point of my ankle, my hips seemed normal, but ah wait, I’m still wearing my cycling shorts! As soon as I realized the water station was upon me and a quick chat with the marshals I dumped the shorts to collect them at a later time. Continuing on from the water station my temperature cooled, my legs ran free again and I began to embrace the tarmac, cobbles and paved routes. My AlphaWolf shoes combined with some elastic laces hugged my feet while allowing them to breath and flex within the shoe without restrictions. Downhill sections on the run allowed almost energy neutral running as I extended my hips and stretched off the flexors that had stiffened up during earlier disciplines. As with the bike all of the run route was open to the public so dodging the occasional pedestrian gave a new lease of life to my wavering mind. Soon however, everything changed as I stated to suffer small and threatening cramps again. Returning to a more commonly used ultra tactic I took the remainder of the race as a fartlek training session. Running fast until the cramp threatened, then stretching, walking and focusing on breathing for short periods. I would run until the suffering broke the back of the pain pleasure barrier, from here I’d pick a tree, lamppost or significant feature to walk to before bounding off. Through this I managed to make up a number of positions in the race as I battled with more experienced triathletes better able to pace their body. The highlight of the run beyond the supporting crowds has to be the route section that passes through the cathedral grounds providing some stunning views. I understand every year Monster have to negotiate hard for this privilege and I cant thank them enough for doing so, every lap it provided a boost both aesthetically and in the knowledge another water station was coming!! Water stations throughout the race were well stocked on both Hammer gels and electrolyte mix with water for those less daring. The gels were a more solid substance than I was used to but filled the churning void in my stomach, giving me the kick I needed. I was also extremely grateful for the electrolyte which complimented my Sports Beans beautifully and washed down the gloopy gel well. This second water station on the run was a welcoming sight not only for the refreshments on a day that broke 28 degrees, but for the long declining hill after that allowed some freedom into the legs and on every lap gained me a few places. Though 21km long, the run consisted of 5 laps which drastically changed the mentality of the event. Rather than struggling it seemed to just flow, and before I knew it I’d collected 2,3,4 wrist bands and I was on my way to the finish. Each lap was a brilliant demonstration of confident route planning bringing together public and private land while allowing free roaming to the spectators to encourage the athletes. The finish line brought relief, relief from the sun more than anything while a welcomed selection of sweets, crisps, bananas and water settled my churning stomach. With the medal placed round my neck I took a seat, relaxed and reflected. Throughout the race I cannot place one fault on organisation, logistics or marshaling. Registration was smooth, transition organised and labelled for each athlete, directional sign posts were brilliant with marshals at tricky areas. The BTF team were exceptionally professional but also keen to help those not ‘racing’. Spectators were even considered in the layout to provide a truly welcomed finish line. The Monster triathlon had something for everyone and I look forward to returning, bettering my very average time next year. The price of registration was very good too, being only £100 for the half, a considerable amount cheaper than most others I’ve looked into. 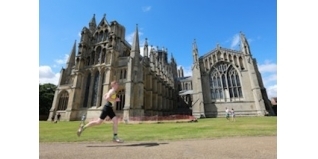 Sadly their triathlon season has come to an end but you will be able to catch the Monster Half, Marathon and Ultra on the 25th September and run through the same streets in Ely, Cambridge. No doubt, another stunning event.